OAKLAND, Calif. -- Lou Williams led the Los Angeles Clippers to the largest postseason comeback in NBA history. The Warriors committed 21 turnovers in Game 1, then 22 more Monday -- nine by Durant. Doc Rivers dropped $2,000 cash on the street in San Francisco earlier in the day -- and offered a pregame "shoutout" to the man with the integrity to return the money. "Kept walking, didn't know it. The guy tapped me on the back and said, that's your money," Rivers shared. "I don't know a lot of places that that would happen, but it happened today, so whoever that was he could have had free tickets if you hadn't ran away." 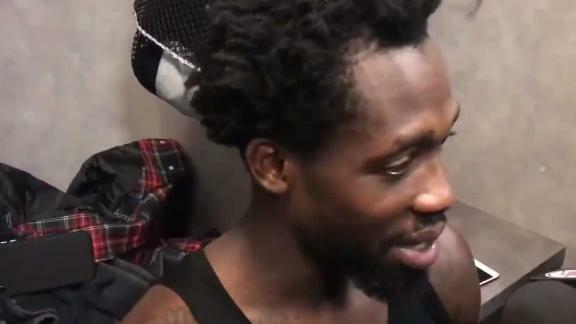 After the Clippers 31-point comeback win vs. the Warriors, Patrick Beverley says he can't help if people are "irritated" by him and talks about defending Kevin Durant.